The folks at Henry Holt and Company sent me a copy of a new book by Orlando Figes, The Crimean War: A History. It’s a big one – 493 pages of text and about 40 more of notes. Earlier this year I finished reading my first comprehensive study of the conflict, Trevor Royle’s Crimea: The Great Crimean War, 1854-1856. I knew virtually nothing about the Crimean War prior to that, other than Into the Valley of Death rode the 600. But it became obvious to me that anyone studying the Civil War owes it to themselves to at least get a handle on what happened in the Crimea in order to put our American war in some kind of context. It quickly became apparent that many of the “firsts” we attribute to the later war were at best seconds. Royle’s book was published in 2000, so the first question is what sets Figes’s book apart? It claims to have drawn on “untapped” Russian, Ottoman, and European sources. If you compare the bibliographies of the two books, it’s obvious that Figes lists a lot more book titles in languages I can’t understand (OK, I remember enough high school German to decipher parts of a few) than does Royle. On the other hand, Figes’s select bibliography does not include the archival unpublished collections that are in Royles. But that’s the thing about select bibliographies – what was the selection process? The real issue for me is whether Figes can do a better job than Royles at keeping all the military and political figures involved straight in the reader’s head. The diplomatic aspects of the Crimean War are labyrinthine, to say the least, and I think Royle took the readers’ familiarity with such things for granted at times. As for pacing, the Light Brigade’s Waterloo is reached at about the midpoint in each book. 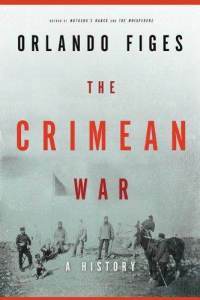 I’m not sure when I’ll get to this one, but if anyone has read it or has a better idea of how it fits into the extensive historiography of the Crimean War, please let us know in the comments section! OK, fine. I just ordered the Figes book to add to the hundreds waiting for me to read in my library. The Crimean War is pretty fascinating. I like the book from the ’60s by Christopher Hibbert ‘The Destruction of Lord Raglan’ as it is written in a very entertaining, reliable fashion. ‘The Reason Why’ by Woodham Smith, ‘The Charge’ by Adkins and ‘Hell Riders’ by Brighton are all excellent looks at the Light Brigade, for those interested. I’m also a fan of the ’60s version of ‘Charge of the Light Brigade’ with David Hemmings. I know everyone compares it to the ’30s version with Errol Flynn but I think it is pretty good in its own right with some really great actors and actresses in it. Plus, really neat almost psychedelic cartoons from ‘Punch’ magazine lampooning the war.